"Photoshop has changed the photographic arena and created new opportunities for artistic expression. Erik Johansson has made international success with his surreal dream worlds. His pictures are pushing the boundaries of reality. Green fields spread out and suddenly enters into a mighty waterfall, where a mill wheel spins. A summer phages rural idyll breaks away from the scenery and sets out on a journey above the clouds. These images may each consist of about a hundred photographs assembled with precision in the computer - the result is fair and realistic at the same time." 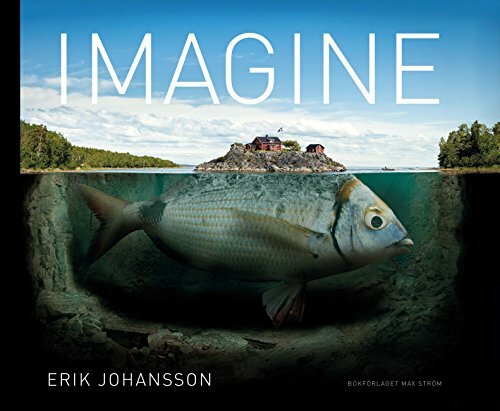 Imagine is Erik Johansson's first book and contains fifty of his best works created between 2007 and 2015. The book is available in English and Swedish and can be purchased in larger book stores and online on e.g. www.amazon.com. In Sweden: Bokus and Adlibris. Endless Reflection, Breaking Up, Soundscapes, Deep Cuts, Expecting Winter, Angry Ants, Nightmare Perspective, Don't Look Back, Cut & Fold, Closing Out, Drifting Away, Diamond in the Rough, Fishy Island, Fresh Frozen Fish, Set Them Free, Dreamwalking, Cutting Dawn, Melting Point, End of Line, Leaving Home, Helping Fall, Groundbreaking, Go Your Own Road, Free Breakers, Common Sense Crossing, Crossroads, Self-Actualization, Iron Man, Zip City, Vertical Turn, Revolving Theory, Twisted Seasons, Lazy Dog, Let's Leave, Big Laundry Day, Lost in the Rain, Intersecting Planes, Landfall, Electric Guitar, Arms Break Vases Don't, Planted Flood, Limitless, Reverse Opposites, The Architect, The Cover Up, Walk a Way, Roadworker's Coffee Break, Snow Cover, Reverberate, Impossible Escape and Work at Sea.